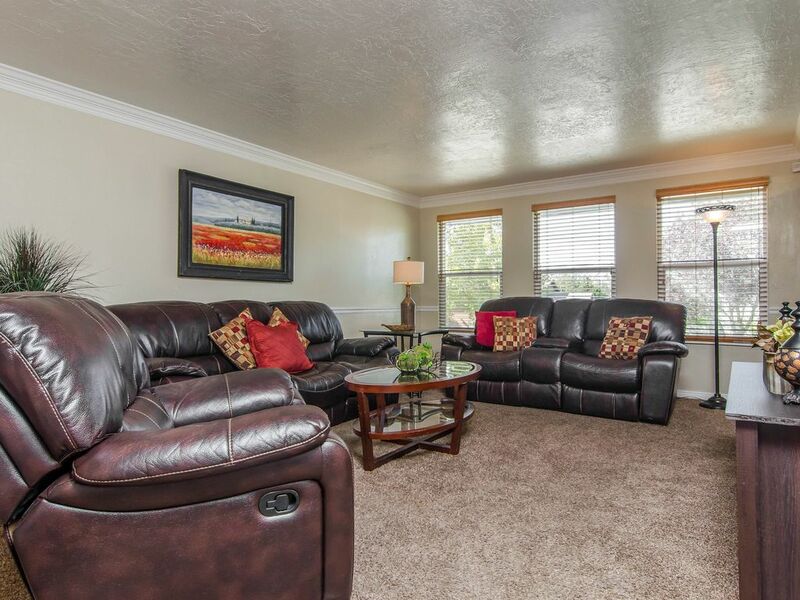 Comfortable 4 bedroom, 2 bathroom conveniently located near Interstate 15 minutes to downtown Salt Lake City. Great for conventions at Salt Palace Convention Center, and close proximity to the new Intermountain Health Care Regional Hospital 1 mile away. Excellent location close to Salt Lake City, skiing, and entertainment. Comfortable, budget friendly, sleeping up to 17 in 11 individual sleeping accommodations. Large yard, room for everyone. With 2 family rooms and private hot tub this home is a great value. When you stay here you also will enjoy discounts offered by our Travel Planners on rental cars, lift tickets, ski rentals, catering, grocery delivery, massages, and personable service to make your stay one to remember. Linens, towels provided with complimentary travel-size toiletries. We had a gathering for the NCAA tournament. This house was furnished nicely with great televisions for watching basketball games. The house was stocked and convenient to the trax station and other Salt Lake valley venues. Well stocked kitchen and home. Hot tub worked really well. Great shower water pressure. Very comfy beds and furniture. Nice electronics ample cookware for large groups. Thanks so much! Very nice and clean. Bedding was nice and has all the amenities of home. Great location for us and all the amenities we needed for our family vacation. Would book again. There were some issues with the property that we addressed in the 24 hour required response time. We sent communications to 4 different email addresses and never received a response to any of them. Another great experience with VROB. Thank you. Great freeway access to get to downtown SLC. Ski 4 resorts at Big and Little Cottonwood Canyons just 7-15 miles to the canyon entrances. Short walk to TRAX public lightrail train station to get to downtown or anywhere in town quickly.